Home » Korina Emmerich » Nick Verreos MyLifetime.com blog » Nick Verreos Project Runway Recaps » Project Runway » Sean Kelly » Season 13 Project Runway Recaps » Season 13 Project Runway » PROJECT RUNWAY.....Season 13 Project Runway Episode 12 Recap: "Sidewalk Catwalk"
PROJECT RUNWAY.....Season 13 Project Runway Episode 12 Recap: "Sidewalk Catwalk"
Lexus Challenge: Tim Gunn announces the "Lexus Challenge"--Episode 12 "Project Runway"
Rooftop View: Tim Gunn and Brian Bolain of Lexus, announcing the challenge--Episode 123 "Project Runway"
Anyhow, Tim and Lexus Corporate General Manager, Brian Bolain (I remember him when he "handed" Oscar Lopez and I keys to our "winning" Lexus cars and we posed with him for photo-op's after we won "Project Runway: Under The Gunn") joined the designers on the rooftop. 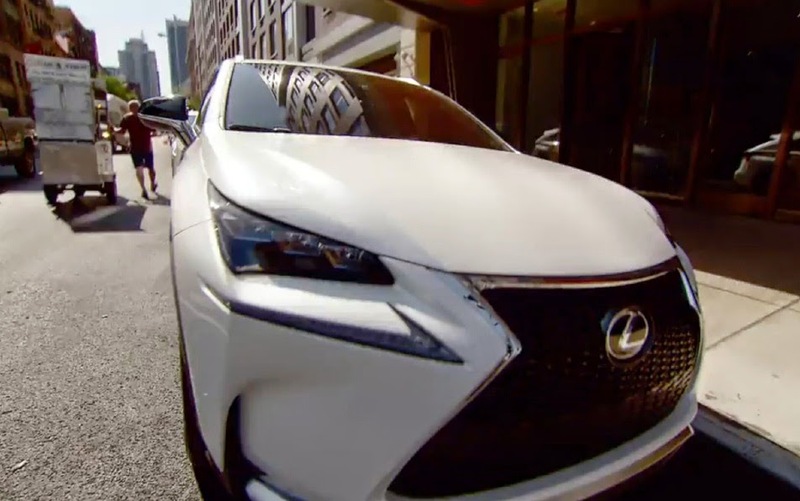 Lexus Bound: The designers got the privilege of being driven around in new Lexus automobiles around NYC to help get photos of their inspiration. Sour Faced and Crossed Arms: designer Korina Emmerich not having any of it--Episode 12 "Project Runway"
Reluctantly (his face speaks VOLUMES--he really has no choice), Alexander Knox returns to help Char--Episode 12 "Project Runway"
Judges included Nina Garcia, Zac Posen, Heidi Klum and "Guest Judge" actress Shay Mitchell from "Pretty Little Liars"--Episode 12 "Project Runway"
Amanda Valentine: the "Street Chic" look (maxi dress top, above) was fabulous--so "Trust Funder at a VIP "Dream Hotel" pool party. Her second "Reworked" look was Hoochie-Tacky. And what is with those stacked wedge heels??? ?Ayyy Dios Mio! Kini Zamora: Kini was deemed one of the best of the night. His trench coat look was NYC Uptown Chic (sans that ruffled skirt) and that one shoulder red gown...it was EVERYTHING!!! 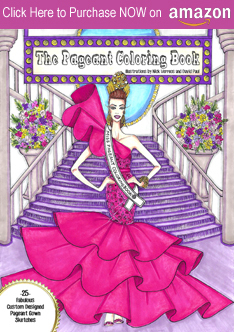 Sooo red carpet fab! 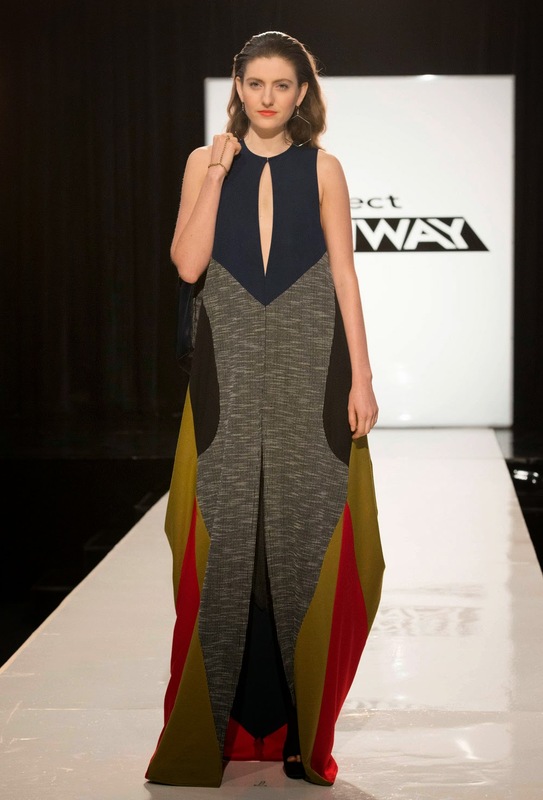 Sean Kelly: For his first "Street Chic" look, the judges GUSHED and called him a "Genius". I did not agree with those comments (you can read that HERE). And, on top of that, his "Reworked" look was George Michael "Faith"/ABBA: The Musical" bad tacky. But alas, the judges--and Tim--think Sean is the "second coming of "Fashion Christ". Go figure. 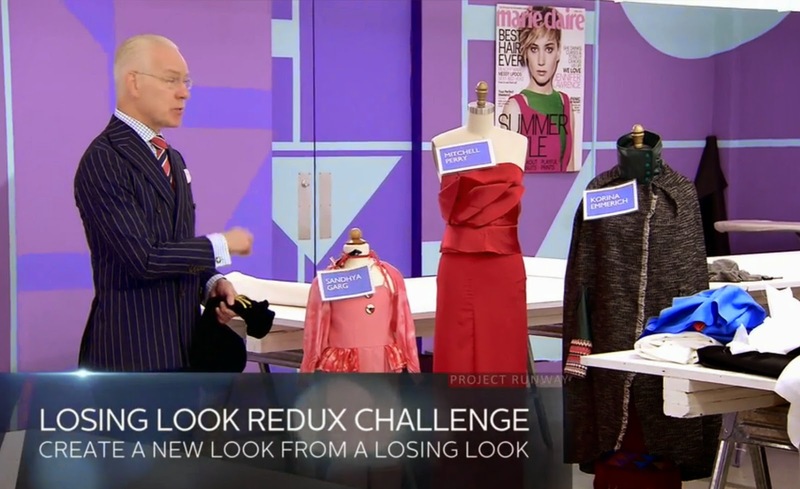 Char Glover: Char created two looks that were not liked by the judges. While I loved the pink color of the skirt, it was a bit disjointed in its design and a bit tacky-licious--especially with that printed crop top. The black sheath dress was BORING. Especially knowing how much fabric she had to work with (in Korina's "Caped Helsinki/Machu Picchu look). But she was SAFE. 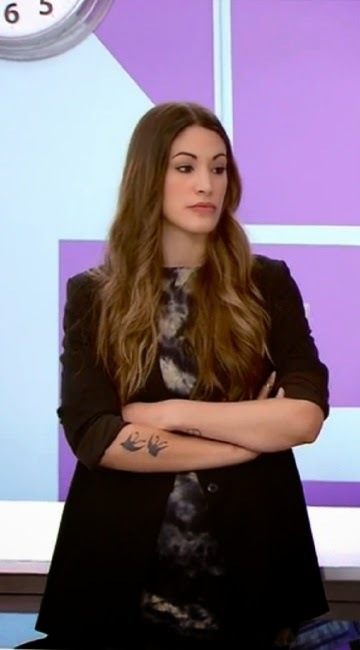 Emily Payne: Emily's Hoodie-and-pajama look and one shoulder re-worked dress were deemed the worst and she was OUT...Not surprisingly. 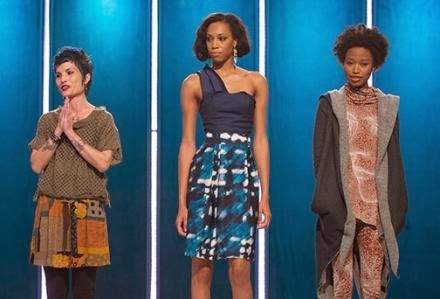 On last week’s “Project Runway," Char and Korina were in the bottom and there was a Sew Off. Char was safe, and Korina ended her time on PR with a very unsportsmanlike “Goodbye." Now, it’s a new week and new challenge, and this one will decide who gets to move on to show at Mercedes-Benz Fashion Week. The stakes are high for sure, so let’s recap who rose up to the challenge -- or, as we found out, challenges. Tim arrives at the Gotham Apartments to give the designers a wake up call. I giggled a little bit when he said “So this is how you all live?” when entering their apartments. Yes, Tim, they sleep next to the kitchen. 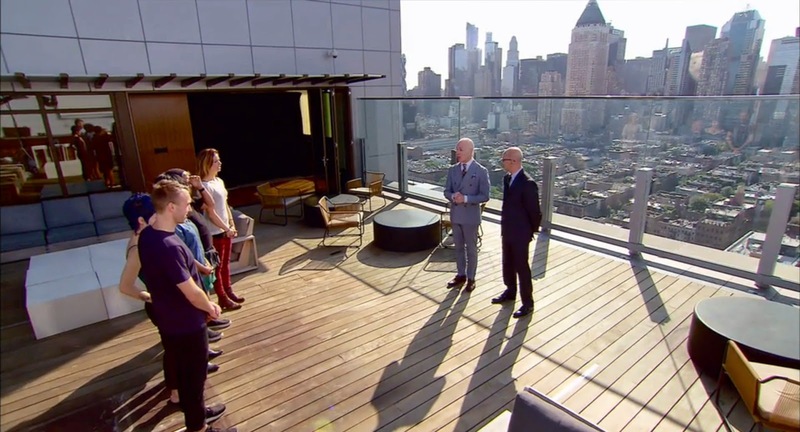 Tim gathers the designers on the rooftop to take in the spectacular view and discuss how many New Yorkers use the sidewalk as their own personal catwalk. Perfect segue to announce the next challenge. The Lexus Challenge is to create a street chic look inspired by NYC. They will get two days to do it. 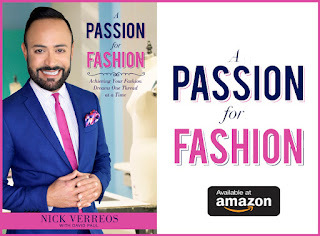 He adds that it should be something that can be worn every day, be fashionable, and be progressive (read: not tired, dated and tacky). Joining Tim in announcing the challenge is Brian Bolain, Corporate General Manager for Lexus. Bolain tells the designers that they will get to drive around NYC in Lexus automobiles for their NYC Street Style Tour. I have to say that I have been to New York City many times and one of the things that I love about it is seeing the diversity of its “sidewalk style” and people-watching. You’ll see skinny-jean and vintage t-shirt hipsters with long beards, Chanel-suited ladies-who-lunch, and Indian women in brightly colored saris -- and that’s just in one block! 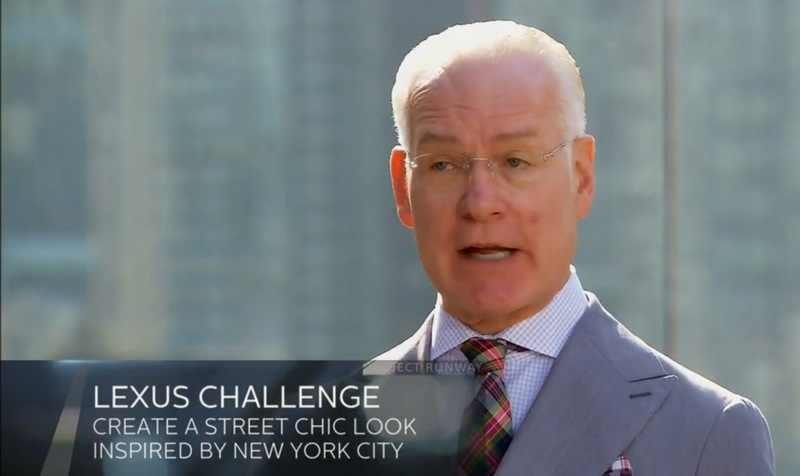 1 Response to "PROJECT RUNWAY.....Season 13 Project Runway Episode 12 Recap: "Sidewalk Catwalk""